Think Progress and the newshounds ‘expose’ Greta van Susteren’s bias. But there’s a catch. GRETA VAN SUSTEREN: Senator, were you surprised to see a Democrat step in like that, in that crowd, because it was very unfriendly to you sir? GRETA VAN SUSTEREN: Senator, what’s it been like for the Republicans going through those crowds? Actually, I’ve been in the State Capitol and they were quite respectful at least towards the media when I was there. But tell me what it’s like for you being a Republican in a crowd that’s protesting against you? You can watch the entire interview and guess what? 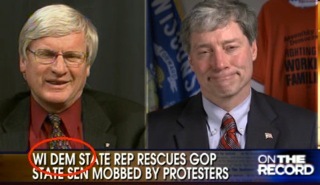 At no point does Greta make any attempt, ‘best’ or otherwise, to get Sen Grothman to say he was ‘threatened’. That’s Think Progress propaganda, concocted to smear Greta van Susteren. And guess who parroted it? Ellen Brodsky! GRETA VAN SUSTEREN: That’s funny, when I see what Rep Hulsey did it’s like, it’s sort of hard for me to listen to that tonight. Because I’ll tell you, Rep Hulsey, he really didn’t have to step forward. He could have walked the other way. So we have Greta’s description of the crowds as respectful, plus her disagreement with the Republican Senator about the hostility being a left-wing thing--both edited out of TP’s video. And that’s on top of the TP lie about ‘best attempts’. Pay attention, students. This is how you smear someone. All of this seems to have discombobulated Ellen Brodsky. After citing TP’s edited video and ‘best attempts’ lie as evidence of Fox’s ‘full-throttle attempt’ to portray demonstrators as unruly (conveniently ignoring Fox reporting that most of the crowd is ‘reasoned, calm, and willing to talk’), Ellen does another post. This time she includes the full video, quotes some of the things TP edited out of the Greta segment, and gives ‘props’ to Greta. But wait...this is the same interview as in the earlier post where Brodsky repeated the ‘best attempts’ lie from Think Progress to slam Greta. In fact, Ellen links to that earlier post as if she were totally unaware that they both reference the exact same interview! We know that Brodsky doesn’t watch Fox or she wouldn’t have fallen for TP’s edited clip in the first place. But doesn’t she even recognize the same interview when the video is sitting right there on her site? Van Susteren discussed the incident on On The Record in a segment FoxNews.com called, Ugly Protest That Almost Got Uglier without noting that it was a Democrat who had calmed the waters. The newshounds are a value-added operation. They don’t just repeat other people’s lies, they add on new ones of their own!